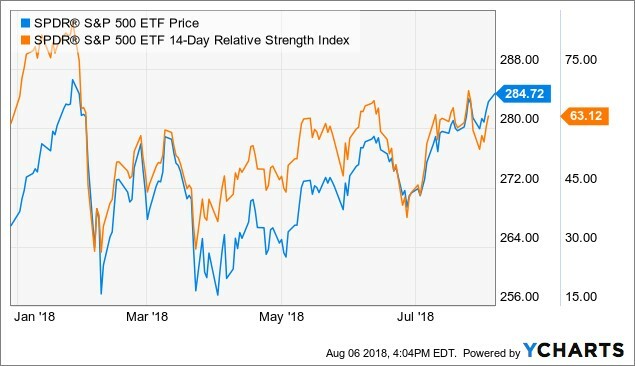 Bull market investors are riding the wave of great earnings reports and improving estimates which aren’t being hampered by fears of a trade war or fears of an economic slowdown. Weakening ISM and Markit services reports aren’t enough to worry investors. It’s easy to ignore them when forward 4 quarter estimates are up 0.6% during this earnings season. They usually fall 2%-3%. As you can see from the chart below, if the S&P 500 makes a new high, it will be the longest bull market since WWII in a few weeks. It’s still quite far away from achieving the total gains see in the 1990s bull market. The S&P 500 was up 0.35% on Monday, putting it at the highest close since late January, which was its record high. The Russell 2000 was up 0.63% and the Nasdaq was up 0.61% as it posted its first 5 day winning streak since May. Facebook stock was up 4.45% as investors are beginning to ignore the weak quarter just like they got over the Cambridge Analytica story earlier this year. Its stock is now up 8.55% from its recent low on July 30th. The VIX fell 3.18% to 11.37 as the summer action is rivaling 2017 in terms of the lack of volatility. This melt up in stocks has taken the CNN Fear and Greed index to 72 out of 100. That signals greed. As you can see from the chart below, the 14 day RSI is 63.12, which is above neutral, but doesn’t signal the market is overbought yet (it needs to reach 70). The 14 day RSI is nowhere near the January peak. The CNN Fear and Greed index is a few points away from the January peak and is nowhere near the 2017 peak. Even though the stock market rallied, the bond market didn’t move much. The 10 year yield fell 0.56 of a basis point and the 2 year yield increased 0.61 of a basis point. The difference between the two yields is now 29.39 basis points. The 10 year yield needs to increase above 3% to avoid an inversion soon. Jamie Dimon, the CEO of JP Morgan, stated he thinks the 10 year yield should be at 4% now and could go to 5%. It’s easy for him to say this because his bank would benefit from rising yields and a steepening curve. The argument for rising rates is that the economy will continue to grow. I don’t like this argument because growth was already strong in Q2. You’re disconnected from reality if you think the same fundamentals will somehow catalyze a change in bond yields. I also think economic growth will slow in the second half which could push the 10 year yield lower. The rate hike in September is a lock as the Fed funds futures market implies a 93.6% chance of a hike. The futures market shows there is a 68% chance of at least 3 hikes by September 2019. Finally, I don’t think yields will rise because of the increasing U.S. deficit because there hasn’t been a positive historical correlation. Actually, rates have come down while the deficit has exploded. In 2017, the deficit and growth increased, but the 10 year yield was flat. The yield has declined with inflation. Each small movement in the dollar index doesn’t matter much to the economy or earnings, but it helps tell us where it is going, technically speaking. I’m not wondering where the next tick will be. I’m wondering when it will break out of the range it has been in for the past 2.5 months. By increasing 14 cents on Monday to $95.37, it is 2 cents away from the closing high it hit on June 28th. A continuation of a bull market run will hurt S&P 500 earnings. 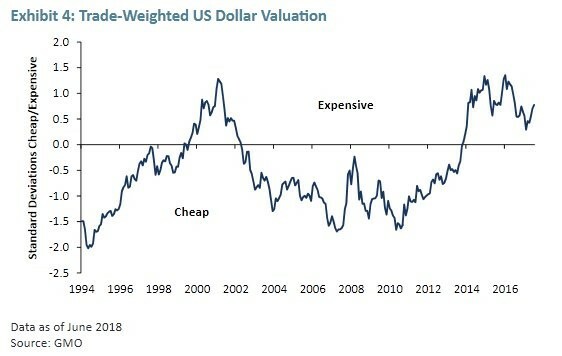 The chart below shows the trade weighted dollar valuation. As you can see, it shows the dollar is expensive. It’s less expensive than the cycle peak and the 2002 peak. The decline in inventories was canceled out by the Chinese pre-purchases of soybeans before the tariffs went into effect. The drawdown in inventories hurt GDP growth and export growth helped it. The future problem is the tariffs will hamper exports and consumption growth. Countries will look to buy their products elsewhere to combat U.S. tariffs. Therefore, U.S. consumers will be hurt by higher prices. Consumers will either need to buy expensive American products or pay higher prices for imports. 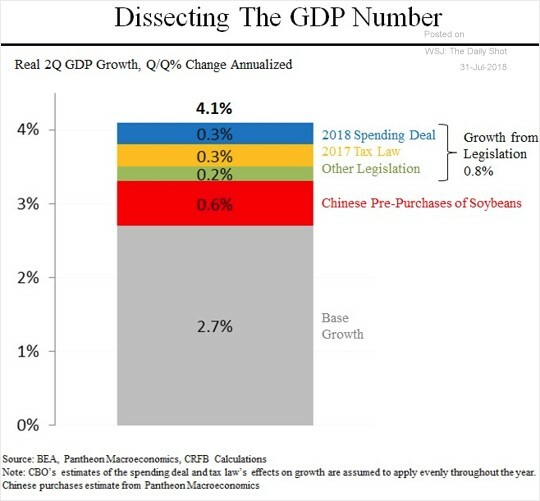 The chart below breaks down the Q2 GDP report. I think the chart is biased because it doesn’t show the inventory reduction which hurt GDP growth by 1%. The growth from legislation is shown to be 0.8%. I am worried the tailwinds from the tax cuts and spending growth will die down next year. The reason I am neutral and not bullish is because of the great earnings reports. As I mentioned in a previous article, great reports can justify an overbought market. We’re at that point now. With 413 firms reporting earnings, 81% of firms have beaten EPS estimates with 25% growth. 76% of firms have beaten their sales estimates with 11% growth. Future estimate changes are pivotal to determining if the quarter was good. 12 month forward estimates are up, but next quarter’s estimates are down. I think it’s possible that the weakness is stemming from the fact that Q3 estimates came in very high. It’s difficult to improve from growth of 23.82% That’s where estimates peaked on July 1st. As you can see from the chart below, Q3 S&P 500 EPS estimates have declined 0.41% while the market was up 3.6% in July. Telcom had the worst month even though it had the highest increase in revisions. Energy had the second highest increase in revisions, but had the 3rd worst month. Consumer staples were up 3.88% even though their estimates were revised down 3.2%.